Searching a trustworthy company to serve you safe and comfortable travelling accommodations could come off as a daunting task to many. Travelling with large group of people only adds up dramatically to this effort. If you are visiting Bolton then you need not to worry as Minibus hire Bolton is there to offer you its superb services for all sorts of transportation needs. Our team is made up of a dedicated staff that assists you in picking the ideal vehicle for your trip. Our services are available for 24 hours a day, 7 days a week, and 365 days a year. Isn’t that amazing? Once your booking is made, it becomes our responsibility to pick you up and drop you at your desired location on time with the help of our skilled driver, which may I mention have a keen knowledge of the area – you will not be disappointed with our services. 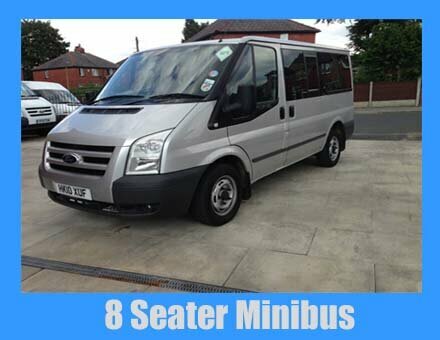 If you are planning your trip with a bunch of 8 people, or even less than that, then we have the right 8 seaters available for rental, for you. We use Ford Transit Tourenos as our 8 seaters which are chosen, rather smartly, for their astounding craftsmanship and blind reliability. It won’t be false to call them luxurious vehicles as they smugly exhibit class and comfort. Their windows are wholly tinted, offering the customers complete privacy. Parallel to the rest if our vehicles, they are also regularly examined and maintained by our expert mechanics. People who are looking for a tad but more than the regular 8 seater experience, an 8 seater XL is up for rent for them. They are very spacious and provide excess space to hold your luggage and trip supplied to be carried around the city, or to from the airport. It is similar in vehicle quality to the traditional 8 seater and makes sure your group has reached its target safely. Our 8 seaters are branded as our most rented vehicle. They are available at prices which are affordable and competitive at the same time. This makes them a popular choice with the customers. Considering the demand of these 8 seaters, it is suggested that you book your vehicle before time. You can contact us through phone or email, or for a more personal experience, visit us at our office. We will help you in making plans that not only suit your schedule, but also don’t take a heavy toll on your pocket. If you wish to see a quote before planning out your entire trip then feel free to fill out the online quote form that is available on our website.